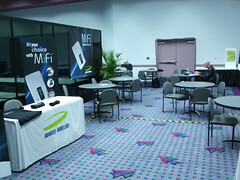 I’m in the Las Vegas Convention Center blogging lounge at CES a nice venue as it was last year. The Venetian lounge is going to be crowded as it appears they have eliminated the press room at that venue so we’ll have both Press and bloggers sharing limited resources over at Venetian. I’m with some CEA bloggers at our Cirque du Soleil KA tour today so i’m hoping to get some insight into the blogging / press / CES continuum. Shout out to Novatel Wireless for sponsoring these lounges which are a nice refuge from the maelstrom of exhibits here at the show.